Hi Ladies! I have a super fun manicure for you all today! I’m rocking some pretty awesome Sally Hansen textured nail polish! Have you tried Sally Hansen products? If not, they’re a must try! I started checking out the Sally Hansen Instagram and I was so inspired by the fun and bright colors that are in for summer! I knew I wanted to get ‘beachy’ with my manicure! So I went to my local Walgreens and I was floored by the giant selection, it was pretty breathtaking to see the fabulous new collections for summer! You can check out pictures from my shopping trip, right here in my Google+ album! 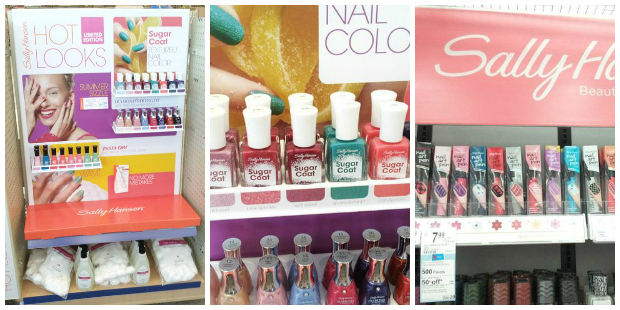 I find inspiration in so many things so after researching some of the swatches of the Sugar Coat polishes that Sally Hansen has out, which can all be found at Walgreens! I grabbed some items from around the house just to get me in the mood, and get a great idea for bright colors to incorporate into my nail art! 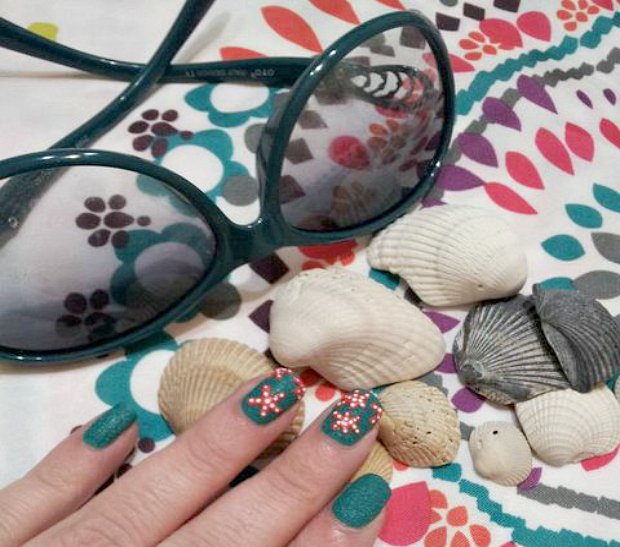 My sunglasses, some seashells a bracelet and if you can believe it, my backup shower curtain actually ended up being the best inspiration I could have hoped for to create my Sally Hansen Beach Ready Mani! The colors just pop, so I knew it would be the perfect start! These displays at Walgreens, really had me ooohhing and ahhhing! It was so hard to choose just a few colors, I wanted everything! Those Sugar Coat polishes though, ahhh just amazing! Super fun and bright colors! Perfect for Summer and just the colors I needed! The sales were just amazing, and they get better and better at Walgreens. From June 30th through July 27th all Xtreme polish is 2/$4 as well as an awesome buy 1, get 1 50% of sale on Sally Hansen Magnetic, Nail Miracle Growth and Crackle polish! I’ll be partaking in that sale for sure, will you? If you use your Balance Rewards card the savings get even greater! I ended up choosing two gorgeous Sugar Coat polishes and a white Nail Art Pen from Walgreens to create my Beach Ready Manicure with! Aren’t they gorgeous? I love to match my nails to my outfits or accessories, it’s super fun and I can say that #IHeartMyNailArt so much so that I came up with the perfect beach ready essentials to go with it! Now that you’re bronzed, glowing and have the perfect beach outfit, let me show you how to create the perfect beach manicure with Sally Hansen textured polish from Walgreens! 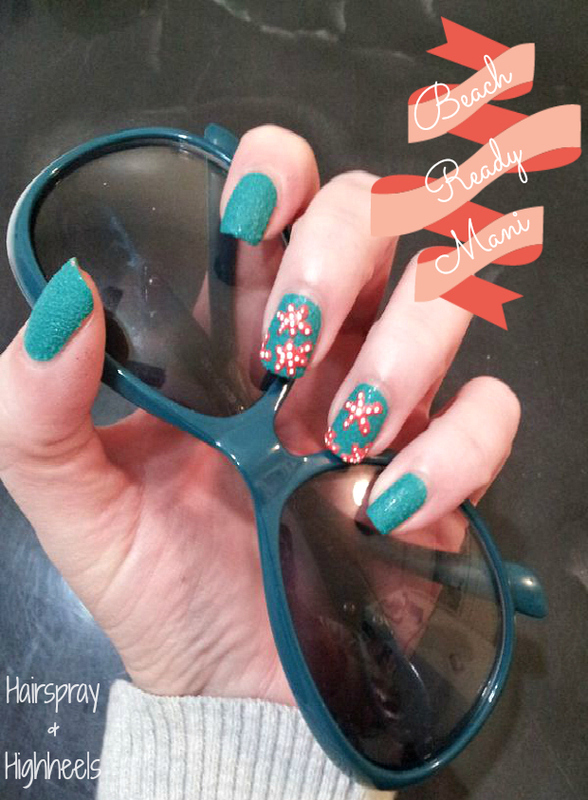 Paint two thin layers of Sally Hansen ‘Spare-A-Mint’ over all of your nails! (I’m a brush snob, and their brushes are perfect) Let your nails dry completely. Drop your Sally Hansen Sugar Coat polish in ‘Candy Corn’ onto your plastic surface and dip the rounded edge (straighten the pin) of your bobby pin into the polish. Use the bobby pin and gently dot out the shape of a starfish (this does not need to be perfect, what starfish is?) onto your two chosen accent nails (or your whole hand if that is what you fancy) and paint on as many starfish as you’d like. Wait about 90 seconds for the starfish to dry. Use your Sally Hansen Nail Art Pen in white to make the small dots on the starfish (this really helps the design pop) on both nails. Let your manicure dry completely, this is where you can choose to either let the mani stay as is (which is what I did) or pick out your favorite Sally Hansen top coat and make it shinier, just remember that adding a top coat could lose the textured effect for you. All done & ready for the beach! I absolutely loved creating this manicure! I feel like it is super fun and definitely is the perfect look for summer and the beach! Do you heart your nail art? 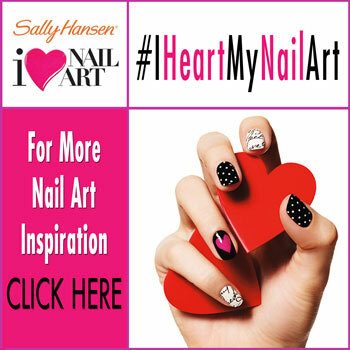 If so be sure to check out Sally Hansen & visit the #IHeartMyNailArt Facebook App for more great inspiration to create the perfect manicure for summer! You can also find Walgreens on Twitter and get exclusive information on the upcoming sales! I was super impressed with the Sally Hansen collections at Walgreens, that I will definitely be going back to pick up some more polish! Create your own manicure and be sure to share it with Sally Hansen on Twitter! 5 Makeup Tutorials: One Great Brand! This looks AMAZING!! I am constantly wowed by your nail art abilities… The best I ever get is an accent nail (or two when I’m feeling adventurous). hmmm my nail art pen does not work like yours! It barely works at all 🙁 i had high hopes because its such a good idea, but I have both white and black and neither works that well. The black works better than the white, the white barely works! I really need to get myself a nail art pen, this seals it! Love your nails, they’re so pretty! Super cute nails, I haven’t tried the sugar coat yet but I definitely need to. Love the starfish! These are gorgeous- I’m totally going to try this look too!!! This is SUCH a cute mani!! OMG I love it! And btw I MISS You linking up to makeup monday! 🙁 lol Come back so I can remember to check your awesome posts more often!! Oh I love this mani! – and the cute beachy outfit as well – great job! So cool! I hadn’t heard of textured nail polish before! Wow! That looks amazing! I haven’t heard of a white pen before. I’m glad Sally Hansen came out with them. I’m gonna have to check them out! Does the textured polish last longer without chipping? I LOVE the starfish detail– that is absolutely adorable. Thank you for the step-by-step! Nail newbies like myself definitely need a good instructional post like this! This is so awesome! I am horrible at doing my nails haha. I’ve always loved Sally Hansen polishes though! I absolute love your nail art! I find textured polishes harder to work with doing nail art and you *nailed* it! Great job! Love your blog. I didn’t realize until now you are a part of the BBC, glad I found you! LOVE LOVE LOVE! That looks just cool. Well done! I mimght have to try this one out myself, it’s really cute! SUPER FREAKING CUTE! Love the startfish design, gosh why can’t I do creative things like this! No patience! Love Love Love!!! OMG!! I love your inspiration and then the design you came up with plus the colors!! So fun! Oh man, I love this so much!!! The colors, the design, it’s all AMAZING! Amazing! I love how the Sugar Coat Polish brings a sandy effect and you did a fabulous job on those starfish!